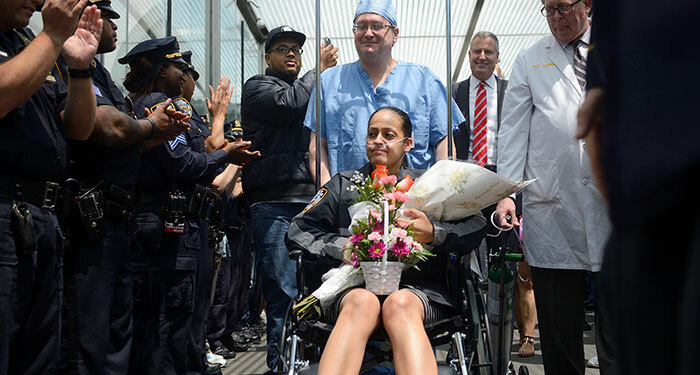 Police Officer Rosa Rodriguez, of Lindenwood, is discharged from Weill Cornell Medical Center in May 2014. At 6:50 a.m. on Wednesday, April 9, 2014, City Police Officer Dennis Guerra, a married father of four from Far Rockaway, was pronounced dead at Montefiore Medical Center in the Bronx. Guerra, who was posthumously promoted to detective at his funeral by then-Police Commissioner Bill Bratton, was remembered on Tuesday by the department he loved for giving his life for his city five years ago. “We will never forget your heroism and the sacrifice you made that day,” the NYPD penned in a heartfelt Twitter post that was accompanied by a photograph of a beaming Guerra. According to the Brooklyn District Attorney’s Office, on Sunday, April 6, 2014, at approximately 12:30 p.m., Officers Guerra and Rosa Rodriguez, both assigned to Public Service Area 1, responded to a 911 call of a fire at a Surf Avenue apartment building in Coney Island. When the cops arrived on the 13th floor, the location of the fire, they were overcome by toxic smoke. Responding firefighters found both officers unconscious and rescued them from the building. Marcell Dockery, 18, who lived on the 12th floor, found a discarded mattress in a 13th floor hallway and used a lighter to set it on fire. He admitted to igniting the deadly blaze and told investigators, according to evidence submitted at trial, “I decided to take a lighter and light the top of the mattress because I was bored.” He was convicted of causing a death while committing a felony, namely, arson. Both officers were hospitalized for severe smoke inhalation and carbon monoxide poisoning. Guerra, a second-generation police officer, fell into coma and succumbed to his injuries three days later. Rodriguez, who lives in Lindenwood, was released from Weill Cornell Medical Center in Manhattan more than a month after the incident. On June 14, 2016, Dockery was sentenced to 19 years to life in prison for murder.